“Amazongate” is an attempt, largely by climate deniers, to prove that the Intergovernmental Panel on Climate Change (IPCC) got it wrong on the impacts of global warming on the Amazon, when it wrote that up to 40% of the Amazon forests could be replaced by savanna ecosystems, with even slight reductions in rainfall. The IPCC’s source for this statement is a report produced for WWF and IUCN, not peer-reviewed science. The IPCC did get it wrong on two counts: First, it should not have used a WWF/IUCN report; and second, had the IPCC used peer-reviewed science it would have produced an even more worrying scenario. Rowell and Moore is the WWF/IUCN report: Rowell, A. and P.F. Moore, 2000. Global Review of Forest Fires. WWF/IUCN, Gland, Switzerland. Up to 40% of the Brazilian forest is extremely sensitive to small reductions in the amount of rainfall. In the 1998 dry season, some 270,000 sq. km of forest became vulnerable to fire, due to completely depleted plant-available water stored in the upper five metres of soil. A further 360,000 sq. km of forest had only 250 mm of plant-available soil water left. Scientists from Woods Hole Research Centre (WHRC) and IPAM (Instituto de Pesquisa Ambiental da Amazônia) who have undertaken ground-breaking work on fires in the Amazon, conclude that “in a scenario of increasingly frequent El Niño events, Amazonia is poised to experience catastrophic forest fire events that dwarf the fires of Roraima in early 1998 and of deforestation activity in scale” . The implications are severe, because if the normally fire-resistant Amazon forest dries out, this could change the hydrologic cycle and hence the whole climate of the region, which has global implications, not least for global climate. 25 January 2010: Right wing climate change denier Richard North wrote that the IPCC “grossly exaggerated the effects of global warming on the Amazon rain forest”. This was the start of “Amazongate”. The IPCC statement on the Amazon is correct, but the citations listed in the Rowell and Moore report were incomplete. (The authors of this report interviewed several researchers, including the author of this note, and had originally cited the IPAM website where the statement was made that 30 to 40% of the forests of the Amazon were susceptible to small changes in rainfall). Our 1999 article (Nepstad et al. 1999) estimated that 630,000 km2 of forests were severely drought stressed in 1998, as Rowell and Moore correctly state, but this forest area is only 15% of the total area of forest in the Brazilian Amazon. In another article published in Nature, in 1994, we used less conservative assumptions to estimate that approximately half of the forests of the Amazon depleted large portions of their available soil moisture during seasonal or episodic drought (Nepstad et al. 1994). After the Rowell and Moore report was released in 2000, and prior to the publication of the IPCC AR4, new evidence of the full extent of severe drought in the Amazon was available. In 2004, we estimated that half of the forest area of the Amazon Basin had either fallen below, or was very close to, the critical level of soil moisture below which trees begin to die in 1998. This estimate incorporated new rainfall data and results from an experimental reduction of rainfall in an Amazon forest that we had conducted with funding from the US National Science Foundation (Nepstad et al. 2004). Field evidence of the soil moisture critical threshold is presented in Nepstad et al. 2007. In sum, the IPCC statement on the Amazon was correct. The report that is cited in support of the IPCC statement (Rowell and Moore 2000) omitted some citations in support of the 40% value statement. This is fully supported by peer-reviewed literature. Contrary to the headline’s suggestion, it is not a “bogus” claim. The IPCC must be held accountable for the best scientific information that is available in the peer-­review literature at the time of its writing.The passage in the IPCC that refers to the susceptibility of the Amazon forest to drought cites a World Wildlife Fund review report which, in turn, cites an article in the journal Nature. Ideally, the IPCC should have cited the Nature article as well as several other existing articles in support of its statement, and not a WWF report. The point is, however, that the statement made by the IPCC about the sensitivity of Amazon forests drought was consistent with our knowledge at that time, and has been reinforced by new studies. The Sunday Times knew that the UN panel report contained an incorrect reference relating to a sentence about the potential impacts of climate change on the Amazon rainforest, and not an error of science. Yet, the Sunday Times published inaccurate, misleading and distorted information which would lead any reasonable person to assume that the UN report had included information that was not backed by the best scientific information available at the time. Furthermore, they used highly selective reporting to imply, by omission, that a leading expert – myself – concurred with them that the IPCC had published an incorrect scientific claim. This is not the truth, and not what I told the Sunday Times, and therefore I consider the article materially misleading. This was a classic case in which the controversy was initiated not by scientists but by the mainstream media, which badly distorted the facts. Blogs and other articles argued incorrectly that a report, the “Global Review of Forest Fires,” should not have been cited as a reference, because it was published by two non-governmental organizations. But the paragraph in question accurately presented results in the literature it cited. It was a small part of a long, well-referenced discussion of Amazonian risk. Although the “Global Review of Forest Fires” was not a peer-reviewed document, it nevertheless was an important compilation, assembling information from more than 100 sources, including peer-reviewed scientific papers and reports from governments and non-governmental organizations, as well as news articles. 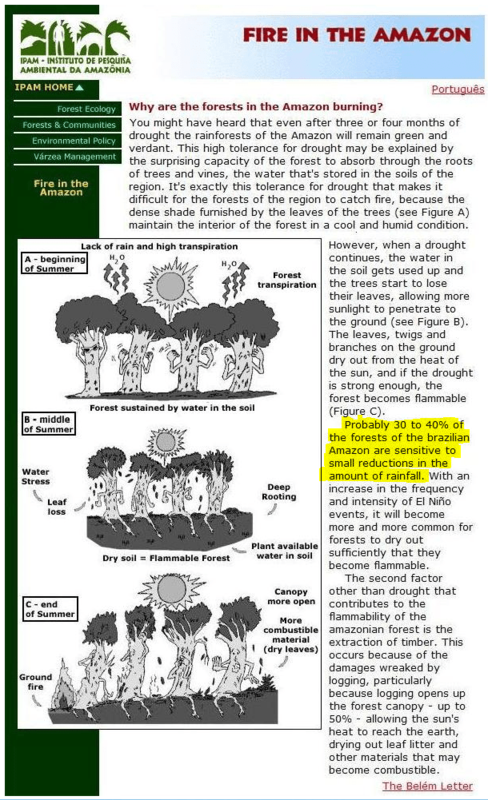 The IPCC claim is tri-fold: first, that a large proportion (40%) of the entire Amazon forest will be ‘affected’, second, that the ‘reaction’ would be drastic, as in sudden, and severe, and third, that this drastic reaction’ could be caused by ‘even’ a ‘slight’ reduction of rainfall, not drought-type conditions. Making exaggerated claims and propping them up, after the fact only diminishes trust in the process. Calling for a correction would have been better than blaming journalists and bloggers, without whom, the experts and the much-vaunted IPCC peer-review did not even recognize these errors. The reviewers comments stands a testimony to this fact. 28 June 2010: Dan Nepstad provided a summary of the available peer-reviewed science on the impacts of logging, fires and climate change on the Amazon forests. In a 1994 paper in the journal “Nature” (Nepstad et al. 1994), we reported that approximately half of the forests of the Brazilian Amazon were exposed to severe seasonal droughts, and that these forest were able to endure these droughts through deep root systems that absorb moisture stored in deep soil layers. These results were refined in Nepstad et al. in Global Change Biology (2004), where we found that, in 2001, half of the forests of the Amazon had depleted at least half of the moisture stored in the upper 10 meters of soil. We also presented evidence in this paper that 75% depletion of soil moisture (reached by 31% of the region’s forests in 2001) was a conservative threshold beyond which forest damage ensued. The 2004 paper, alone, provides plenty of support for the IPCC statement. 2 July 2010: George Monbiot posted an overview of the “Amazongate” story on his blog on the Guardian website, listing the peer-reviewed science on the impact of global warming on the Amazon forests. We have a minor comment to make on this statement, which originates from Section 13.4.1 of Chapter 13 (page 596). The statement was based on Rowell and Moore (2000), which is a peer-reviewed report by the World Wide Fund for Nature and the International Union for Conservation of Nature (WWF/IUCN) on a global review of forest fires, and not a study on changes in vegetation due to climate change. That report, in turn, was mainly based on Nepstad et al. (1999) (in Nature). In our opinion, both documents were not the most obvious choice of reference in this case, as their focus is on forest fires (and logging). More adequate peer-reviewed, scientific journal literature would have been available to support this statement, such as Cox et al. (2000; 2004) (C6). This minor comment has no consequences for the IPCC conclusions in the various Summaries for Policymakers. Only two instances were found of statements relying on references to grey literature, when literature published in peer-reviewed journals was also available to which referencing would have been more appropriate. For example, the statement that up to 40% of the Amazon Rainforest could react drastically to even a slight reduction in precipitation was underpinned by a reference to a peer-reviewed WWF/IUCN report of 2000 on forest fires, while – in this case – also more relevant high profile peer-reviewed journal articles had been published by Cox et al. (2000; 2004). In our opinion, this issue deserves more attention from IPCC authors in the future. We consider it a minor comment. Cox, P.M., R.A. Betts, C.D. Jones, S. Spall and I.J. Totterdell, 2000. Acceleration of global warming due to carbon-cycle feedbacks in a coupled climate model. Nature, 408, 184-187. Cox, P.M., R.A. Betts, M. Collins, P.P. Harris, C. Huntingford and C.D. Jones, 2004. Amazonian forest dieback under climate-carbon cycle projections for the 21st century. Theoretical and Applied Climatology, Volume 78, Numbers 1-3 / June, 2004, pp 137-156. The IPCC should not have used a report produced for WWF and IUCN instead of peer-reviewed science. The Netherlands Environmental Assessment Agency was wrong to claim that the “up to 40%” statement is supported by Cox et al 2000 or 2004. No specific statement in either paper directly supports this statement. There seems to be no specific statement anywhere in the peer-reviewed literature that “up to 40% of the Amazonian forests could react drastically to even a slight reduction in precipitation”. It does not appear in Nepstad et al 1999 – which in any case is a report about the impact of logging and fire on the Amazon and not about the impact of reduced rainfall. However, there is plenty of peer-reviewed science about the threats to the Amazon from logging, fire and climate change. Had the IPCC actually referred to Cox et al 2004, for example, they could have written a different statement, with far more worrying implications. Amazonian temperature rises by more than 9K over the 21st century, and rainfall drops by an alarming 64%. Together these changes lead to a 78% loss in vegetation carbon and a 72% loss in soil carbon. When the forest fraction begins to drop (from about 2040 onwards) C4 grasses initially expand to occupy some of the vacant lands. However, the relentless warming and drying make conditions unfavourable even for this plant functional type, and the Amazon box ends as predominantly baresoil (area fraction >0.5) by 2100. A 2008 report by Dan Nepstad and colleagues forecasts that by 2030, 31% of the Amazon will be deforested and 24% will be damaged by drought or logging. The reality is that the Amazon is under serious threat and the discussion about whether the IPCC made a mistake is a distraction. The IPPC was wrong to use a WWF/IUCN report as a source, but it makes no sense to subsequently change the source – particularly when the sources cited do not back up the specific statement in the IPCC’s 2007 report. What would make sense is for the IPCC to admit its mistake and refer to the science about the threats to the Amazon. Unfortunately, “Amazongate” is unlikely to go away any time soon. At least not until more than half the Amazon is reduced to bare soil.